The Alliance For Democracy - News, eNewsletters, Alerts and Chapter News: ...and in northern California! 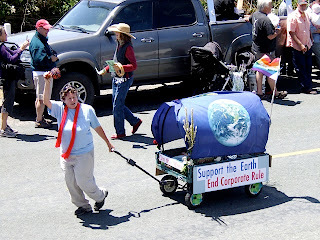 Mendocino Alliance for Democracy members and friends joined the march for the community's Fourth of July parade last Wednesday. The group was not only celebrating democracy, but also their recent petition drive to get an anti-corporate personhood ballot initiative before Mendocino county voters in November. Organizers collected some 70% more signatures than needed to get the initiative on the ballot, and so while the signatures still have to be certified, they're very hopeful that the first hurdle's been cleared. For more photos, check out this album on our Facebook page.